You should use WContainerWidget::setOverflow(OverflowAuto) to automatically show scrollbars for widgets inserted in the layout to cope with a size set by the layout manager that is smaller than the preferred size. Adds a nested layout to the layout, returning a raw pointer. The alignment specifies the vertical and horizontal alignment of the item. The default value 0 indicates that the item is stretched to fill the entire column or row. 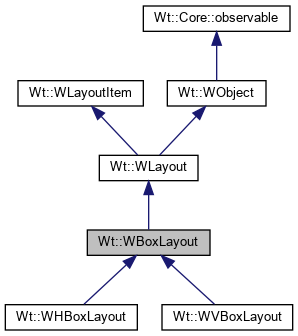 The alignment can be specified as a logical combination of a horizontal alignment (Wt::AlignmentFlag::Left, Wt::AlignmentFlag::Center, or Wt::AlignmentFlag::Right) and a vertical alignment (Wt::AlignmentFlag::Top, Wt::AlignmentFlag::Middle, or Wt::AlignmentFlag::Bottom). Adds a widget to the layout, returning a raw pointer. Inserts a nested layout in the layout, returning a raw pointer. The alignment specifies the vertical and horizontal alignment of the item. The default value None indicates that the item is stretched to fill the entire column or row. The alignment can be specified as a logical combination of a horizontal alignment (Wt::AlignmentFlag::Left, Wt::AlignmentFlag::Center, or Wt::AlignmentFlag::Right) and a vertical alignment (Wt::AlignmentFlag::Top, Wt::AlignmentFlag::Middle, or Wt::AlignmentFlag::AlignBottom). Inserts a widget in the layout, returning a raw pointer. Changing the layout direction after something (a widget or nested layout) has been added is not supported.